I might be biased but I am convinced I will introduce you to THE BEST homemade BBQ Bacon Burger Recipe today. Guys it’s not a secret that I am a bit obsessed with burgers. Okay, massively obsessed. Okay, like the most obsessed person I know. Though my husband is not complaining because he probably makes a close second place. You will probably know that I am not really good at prepping food. Sometimes it works like with this Lemon Garlic BBQ Chicken Recipe but usually I am sucky at it AND also still like my kitchen downtime in the evening after work. So I tend to play by ear what we will have for dinner. Stefan and I are this annoying kind of couple who talk on the phone during the day at least once and send us emails, what’s app or facebook messages to keep in touch. This is not only to send us cheesy love messages but mainly to share information, remind us of things we need to do and negotiate dinner. Stefan is the most easy AND at the same time the most difficult person when it comes to making dinner plans. He will eat anything I make and be happy with it but at the same time his contribution to deciding what we will have is pretty much that he requests our food to be yummy! I know, almost too helpful! But whenever I suggest this BBQ Bacon Burger Recipe for dinner (which will lead to a leftover burger lunch) I can envision the smile that spreads over his face. I swear I can even hear this smile through the phone. Why is this recipe so great? Probably because I am still a bit snobbish when it comes to my burgers. I have complained probably a good 100 times about the lack of great burgers here in Germany. Of course there are exceptions but definitely not somewhere close to where I live. I am just hooked on the way you can eat Burgers in the UK and US. Hence the appearance of homemade burgers as well in my kitchen but also on my various social media accounts. Recreating is definitely my coping strategy! Hence if I am really being honest I don’t have much to complain about. 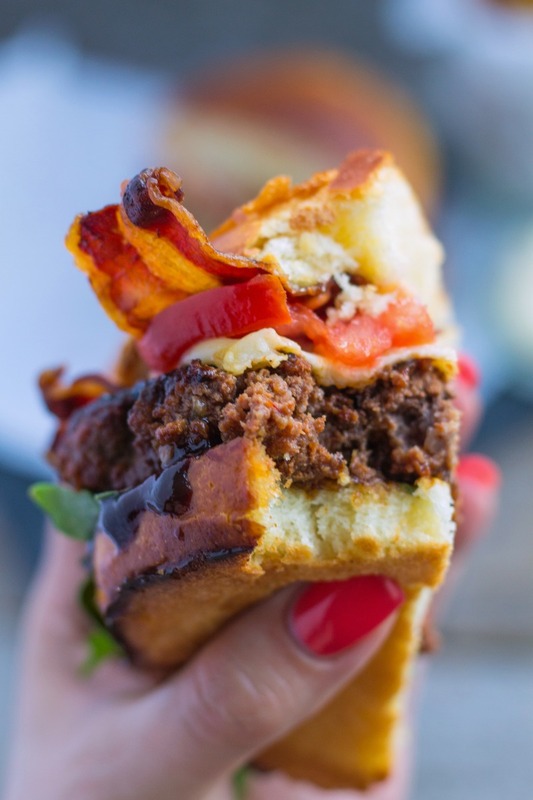 Whether it is my favorite Spicy Beef Burger Patty or this BBQ Bacon Burger Recipe I get my fix here at home, too! 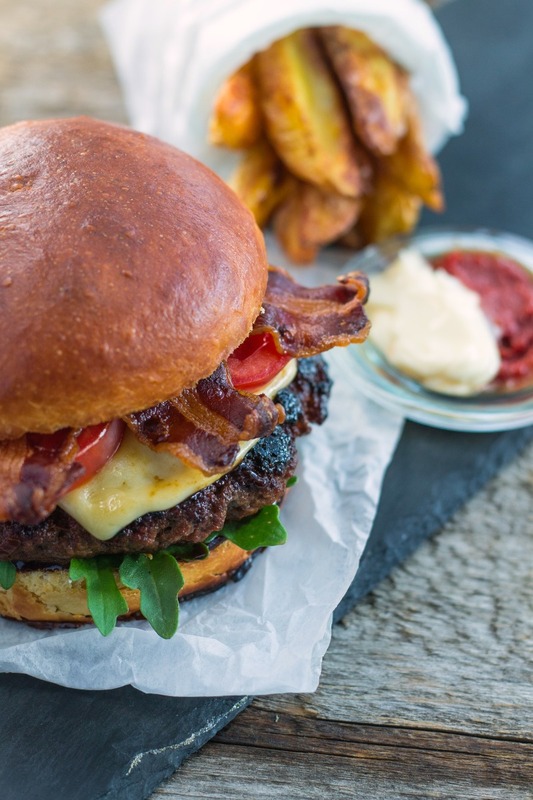 This BBQ Bacon Burger Recipe is a texture and flavor lover’s dream. It is tender and mellow on the inside due to the use of acids in the marinade. Yet it is also crispy on the outside due to the caramelized sugar from the orange juice and molasses. When you bite in the burger you experience a fantastic subtly smokey flavor while the predominant sensation remains lavish and juicy. 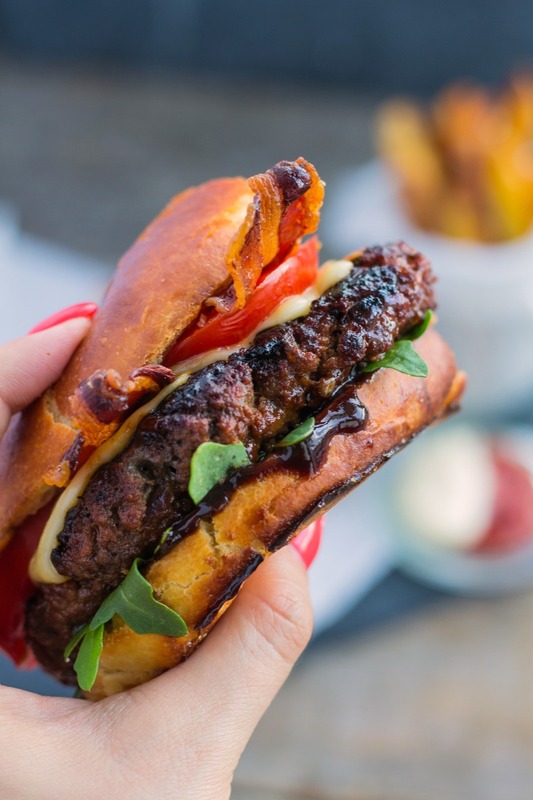 The addition of crispy bacon and melted cheese on a cripy bun make this BBQ Bacon Burger Recipe the jackpot recipe for every burger lover. But maybe this is still not enough to make you lust for one of these beauties! Then probably the prepping time will seal the deal for you. It literally takes no longer than 10 minutes to prep plus some extra time for the meat to soak up the flavors and cook. This is THE recipe for the lazy! Well for sure I am one of them! 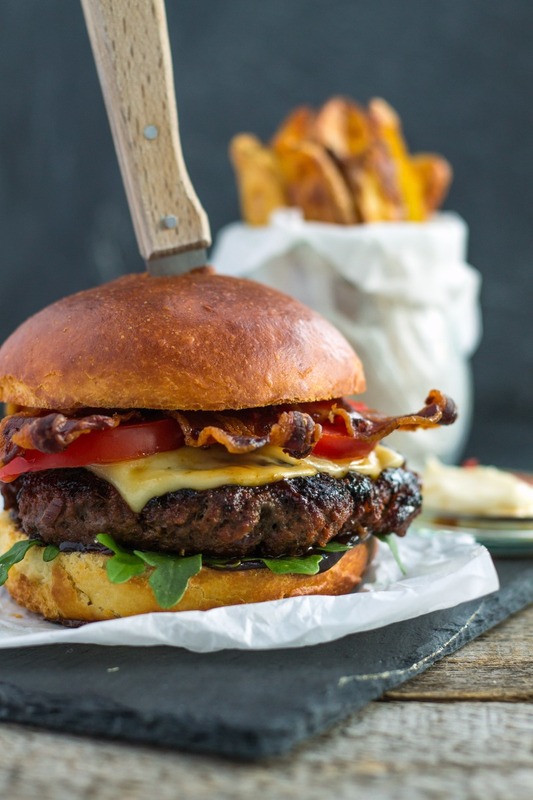 A lavish and juicy burger recipe with a hint of smokey flavor. Tender in the inside and crispy on the outside this recipe is a texture and flavor lover's dream! Top your burger bun the way you want and dig in! The acid in the marinade makes the meat really tender but also prone to break apart. So flip it over really carefully! As a result of spending the last hour staring at burger pictures I am dying of my cravings now. Good luck we haven’t made any dinner plas yet. Maybe I should call Stefan and suggest BBQ Bacon Burger for dinner. First of all for the sake of eating burgers but also for his gorgeous smile! I’m so glad we aren’t the only ones who message their spouse throughout the day – I usual just message david random stuff, links and videos. It would be odd not to hear from him all day! Haha maybe. I mean nothing can go wrong with a good burger, right? Oh get you some liquid smoke. Game changer in my meat recipes! The BBQ Chicken is happening once a week for weeks now and this burger has made its appearance a couple of times too. I crave the smokey so much lately! Jesse would loveeeeeeeeeeeee this! You are totally the burger queen! Don’t worry, Jesse and I are pretty much in constant contact too. Whenever we’re away from each other we’re texting/facebook messaging and we tend to do everything socially together too! Add Flipside to our list of things to do. It’s a burger joint and people love it. I can only attest for their thrice fried sweet potato fries (heavenly) so I’ll let you do the honors with the burger.